Tonight, Alex Stupak will host his fourth Push Project guest dinner at Empellón Cocina. His co-chef for the evening: Grant Achatz, who just so happened to be Stupak’s boss at Alinea. Earlier this week, Achatz suggested doing a second night with a completely different menu: “You know, the spirit of the whole thing is to push yourself,” he says. “So it’s like, Why not? Let’s go.” That second dinner will also include contributions from chefs like Wylie Dufresne and Ken Oringer — also former bosses of Stupak’s. (“There’s a great feeling of pride that I have a restaurant where I can invite someone that I used to work for,” Stupak says.) Also on the roster: Next’s Dave Beran and Aviary’s Andrew Brochu. But for now, the focus is squarely on getting everything ready for tonight’s pre-turkey-day feast. Grub sat down with Stupak and Achatz yesterday to talk about the meal, any future expansion plans for each chef, and what it means to manage (and maintain) a talented kitchen staff. So who had the idea to do a Thanksgiving dinner? Alex Stupak: That was me. After Grant said he’d do this, he said, What’s the concept? That was the first time somebody asked that. We hadn’t thought about these dinners like that. I paused and thought about it for a second, and pitched one other idea, but it didn’t make sense. So I said Thanksgiving. Why focus on that specific meal? Stupak: At the end of the day, to the point of being creative, there are two ways to to think about it: You’re either attempting to create something that doesn’t exist, like a new flavor combination or whatever. Or you’re trying to get someone to take a second look at something that does exist and that they have an opinion on. We liked the idea of focusing on familiarity. We like that there’s a challenge because people have a reference point for Thanksgiving. What are you trying to reference besides obvious things like turkey, mashed potatoes, and stuffing? Grant Achatz: We’re looking at it from an ingredient perspective, as you mentioned. But also we asked each other, What is Thanksgiving? You start researching and you realize that there’s regionalism in the United States. And there’s nostalgia and memory: snapping a wishbone, sitting at the kiddie table, all of those things. So we pulled it all apart. So what are the logistics of organizing and planning something like this if you’re in different cities, and both running multiple restaurants? Achatz: It was all pretty much via e-mail because of our schedules. Stupak: You’re inviting a guest, and they’re putting themselves out by coming, so they get first crack in terms of ingredients and concepts or things they’re passionate about doing — that’s how we did it. Stupak: I wrote a menu, and he wrote a menu, and he gave me his menu and his menu reinformed what I was going to contribute to it. Grant, did you bring other cooks and chefs? Achatz: I brought the executive chef of Next, the executive chef of Aviary, and our research-and-development chef. So who’s running things in Chicago? Achatz: Nobody, you don’t want to go to my restaurants right now. No, I’m kidding. We have a large bull pen, let’s put it that way. After last year’s Eleven Madison Park dinner series, it seems like the Grant Achatz Meal in New York is becoming an annual autumn tradition. Achatz: Yeah, I don’t know how that happened, but you’re right. Are you tired of people asking you about opening in New York? Achatz: If somebody gives me the space, we’ll open tomorrow — you can’t really predict that stuff. Stupak: There are so many factors involved. Achatz: You can’t predict that stuff, so it’s impossible to say. The only thing I will say is that we never stop looking. But Alex, you left Alinea specifically to come to New York. Stupak: I love Chicago, but Lauren [Resler, Stupak’s wife and Empellón’s pastry chef] and I had decided it wasn’t going to be our home forever. And if restaurants are truly your life, there are a lot of restaurants in New York. And wd~50 was a logical choice because most pastry chefs have to make panna cotta and vanilla ice cream and whatever fits into the vision of the restaurant where they work. I had the opposite experience at Alinea because I didn’t make normal desserts ever, so which restaurant could you possibly go to in New York City that’s going to allow you to continue to do that? I could only think of one restaurant for that. That brings up an interesting point: When your restaurants are so highly regarded, you must both deal with people leaving, or other chefs and owners trying to poach talent from your kitchens. Stupak: That really becomes the impetus for expansion for me. We have someone here at Cocina now who started as a line cook, then he expedited, and he started to get the philosophy, and we sent him over to Taqueria and he ran that successfully, and now you think, Well how do I keep that guy? And there are two great sous-chefs under him, and they want his job, so you have to move them somewhere, and if you don’t eventually open another restaurant, they’ll go elsewhere. Opening a new restaurant doesn’t really make you more money — at least not for as much trouble as it’s worth, right? Stupak: So if there’s greed in expanding, it’s for the talent. But being a chef, managing people, is a completely different skill set than simply being a good cook. Achatz: You become a director. Stupak: You start as a cook, you wake up every day, and you work on your feet for fourteen or sixteen hours a day. There’s this feeling that if you stop even for a second, you … I can’t describe it. You become very uncomfortable. Achatz: You’re almost programmed, when you’re a young cook working under these great chefs. The work ethic and the responsibility and the dedication becomes so ingrained in you that your mind can’t fathom being without it. Cooking as a discipline in the kitchens where we cooked, the mentality is, you’re responsible for this. [He draws a square on the table.] And most cooks and chefs have an ego, so what you do is you say, Nobody touch this; this is mine. Once you get a restaurant, the whole thing becomes mine and you want to control every facet of it. But you very quickly realize that it’s impossible. Achatz: It’s a weird misconception. I remember being at the French Laundry around 1998, and one of the longtime customers came into the kitchen, in the middle of service. And Thomas [Keller] was about to announce that he was opening Per Se. And the regular was chatting and says, I hear you’re opening this restaurant in New York. What are we going to do? When you’re there, who’s going to cook the food here? And Thomas just gestured to all of us in the kitchen and said, All of them. Even when we’re in the house — we’re very active in our kitchens compared to other chefs — but it’s not like we touch every plate. When you’re coming up through a kitchen, does it get to a point where you just become used to the long hours and the stimulation and pressure? Your body has to readjust when that part of the job is gone? Stupak: For me, there’s a physical aspect to it. I try to dedicate a day a week to e-mailing, writing, working on a cookbook, that kind of thing. So that’s work, you’re working, but I feel like I’m getting soft and not doing the work. Achatz: It’s true. You feel guilty. Stupak: It’s a mental game, but it’s also a physical job, you’re moving around quite a bit. And it feels very strange to transition away from that. But when a member of your team can conceptualize a dish that is perfect and within the style of the restaurant, but you as a chef didn’t think of that idea, that’s pretty cool because then you’re talking about a culture. Achatz: That you created, essentially. Stupak: Grant, when did that feel like it clicked at Alinea? It takes a long time, right? It’s not in the first year, or even the second year. Achatz: The big thing for me was when I got sick. I wasn’t physically able to be there all the time, but I also just wasn’t able to stand there for fifteen hours. Remember how you and I used to race each other in? I’m not even kidding. Stupak: We raced to be the first one in the kitchen every day. Achatz: It was like 9:30, 10 in the morning and we would leave at 3 or 4 in the morning. It was ridiculous. But when I was going through treatment I couldn’t do that any more. And it forces you to relinquish control and then you realize that it’s okay to trust, and it’s okay to delegate. You can chill out, you know. That’s when the lightbulb went off for me. 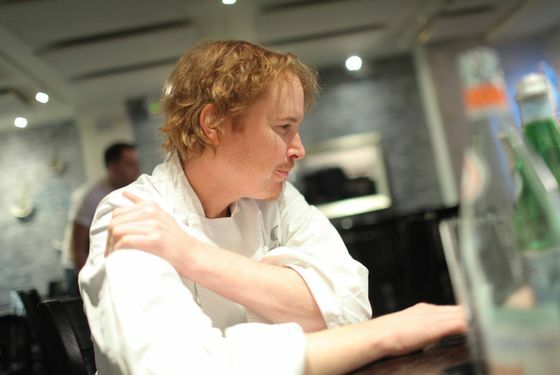 Achatz: When we opened Next, I was there a lot, like 70 hours a week. And I’d spend maybe ten at Alinea, to make sure they were okay. But the focus was getting Next off the ground, giving them the platform, and making sure Dave [Beran, executive chef] was confident. And after Paris, our opening menu, I’d say that’s when it was smooth sailing. We’re going to open more places, and I’m sure Alex will at some point. I’ve got three of my best guys here in New York, and three more back home, and unless you provide them with certain opportunities to grow as professionals and as people, they’re just going to go somewhere else, or find it on their own. So it’s nice to engender that and provide that for them. And of course opening a new place informs the older restaurant. Achatz: Absolutely, there’s a lot of crossover. Not only with ideas, but it gives us more flexibility. We’ve had several people who have gone from Alinea working in the front of the house, say, moving their way up from a food runner all the way to a captain who can go over and be a general manager at Next. And then, vice-versa, we have somebody at Next that enjoyed the restaurant but wanted to be part of a Michelin three-star environment, and they ask if they can go over to Alinea. So you have a lot of this going on, which also breeds a more unified company identity, where standards are upheld, people are self-policing. If you go to Per Se, then you go to Bouchon, there’s a certain level despite them being two different restaurants. The dude that was at Alinea for seven years that went to Next had a very clear sense of what was right and what was wrong and could help form that culture. So the goal is always hiring at lower levels and promoting from within, instead of hiring managers from outside? Achatz: Especially in the kitchen, we’ve never brought in a managerial level position. It’s always people moving up. Stupak: I have tried. And I don’t recommend it. And if you’re trying to go so fast that you’re not building the sous-chefs, you need to rethink what you’re doing. Achatz: Of course you want talented cooks, craftsmen, but if you’re hiring in a sous-chef or chef de cuisine, it’s not all about how good a cook someone is. Stupak: It’s about the culture of the restaurant.